Exceptional Services. One Unique Experience. Sound & Vision designs, engineers and installs home automation systems to simplify your life. Home automation streamlines and simplifies all of the technology in your home offering convenience and control of otherwise complex operations. Lighting, security, audio video systems, climate control, motorized shade systems or even your pool can be accessed and controlled with just one touch from anywhere in the world. With Sound & Vision meticulously designing multi-room audio and video, entertainment is always within your reach. A simple touch of a handheld controller or elegantly mounted wall-touchpanel activates sound anywhere in your home. 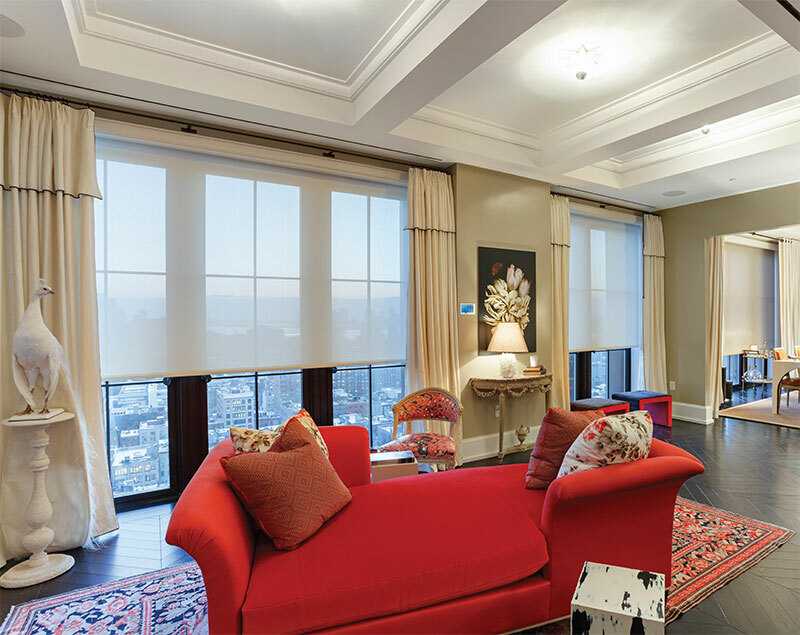 Our integrated lighting control solutions include motorized shades - adding beauty, convenience, and comfort throughout the home. Featuring exclusive Quiet Motor Technology™, our shades provide silent operation and convenient, one-touch control. What makes Digital QMT™, our exclusive motor technology, so unique is the brushless motor design. Brushes in DC motors wear over time, causing the motor to fail. Our new brushless motor provides greater reliability, much longer life, and ultra-quiet operation. Even better, automated shades lower utility bills and increase the home's value and security. For modern movie lovers, nothing stirs the soul like the impact of an earth-shaking sound effect or the enveloping warmth of a lushly orchestrated soundtrack. Create the ultimate private Home Theater. Sound & Vision provides complete home theaters mostly in and around the Chicago area but occasionally around the world as well. Whatever your needs Sound & Vision knows how to deliver the theater experience to your home. Outdoor is the new favorite place for entertaining, relaxing and enjoying friends and family. But what happens when you bring all your party guests over for some grilling, swimming and chillin, but the cool AV gear is all in the house? Our solutions keep your home comfortable at all times monitoring temperature and humidity levels automatically. No need to get up or even be home to adjust climate controls, with Sound & Vision, you can control multiple zones from one location and easily preset temperature set points. From corporate boardrooms, digital collaboration, smart classrooms, — our experience in design, installation, and service of commercial audio-visual systems throughout the country is vast. Whether you need a video-conference system, a video wall or a music solution, Sound & Vision helps you choose the right technology for your business needs. Whether it's movie night, an intimate dinner for two, a business party or a quiet Sunday brunch reading the newspaper, lighting establishes the right mood. Traveling out of town or working late? The lights can execute pre-programmed scenes to simulate established lifestyle patterns. Wireless connectivity has forever transformed and enhanced our lives. It’s also been at the center of great interest on what if any long-term effects there will be. While we’re certainly not an expert on the subject the information we have collected over the years raises some interesting facts.